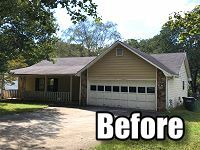 Come See this Easy Rehab Project in Snellville! Please join us on Tuesday, February 5, 2019 at NOON for the Atlanta REIA Onsite Renovation Group (ORG) to learn all about finding, funding, fixing and flipping houses for big profits right here in the metro Atlanta area. This month’s 1st rehab project, located at 3961 Summer Pl, Snellville, GA, is “light” ($40K) rehab. This is a 3 bedroom, 2 bath, 1300 sq ft, ranch home built in 1984 with a 1/2 acre lot. The house was a pre-foreclosure found by driving for dollars. Mark Green and Todd Williams, who are managing the rehab project, have about a $40K rehab budget and hope to finish the project in 4 weeks. On the interior, they have opened up the floor plan and are replacing everything. The exterior will be painted, along with new gutters, new doors, new garage door and lighting. The front porch columns were wrapped and deck repaired. Come see their progress before they wrap this one up in a few weeks. 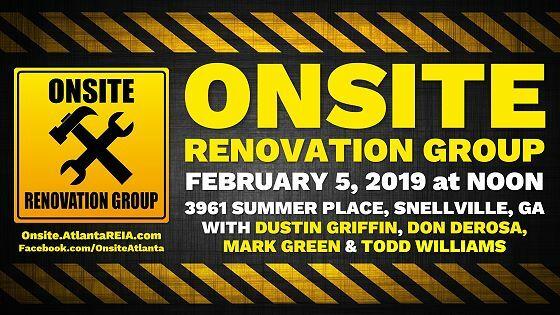 The Atlanta REIA Onsite Renovation Group (ORG) is an educational and networking group led by Dustin Griffin and Don DeRosa that focuses on the acquisition, renovation and retail resale (fix and flip) or rental (buy and hold) of single family residential homes. The purpose of the group is to allow both new and experienced rehabbers and investors to meet, network and share knowledge and experience with “hands on” access to real property.